Greetings and welcome to March! Where have the last two months gone? The weather has been so wonderful and so I’ve been spending a lot of time outdoors. On one of my walks recently I spotted this coffee table curb side. I couldn’t let it go in the trash, so I rescued it! This coffee table was in great shape, just a bit dusty and dirty. 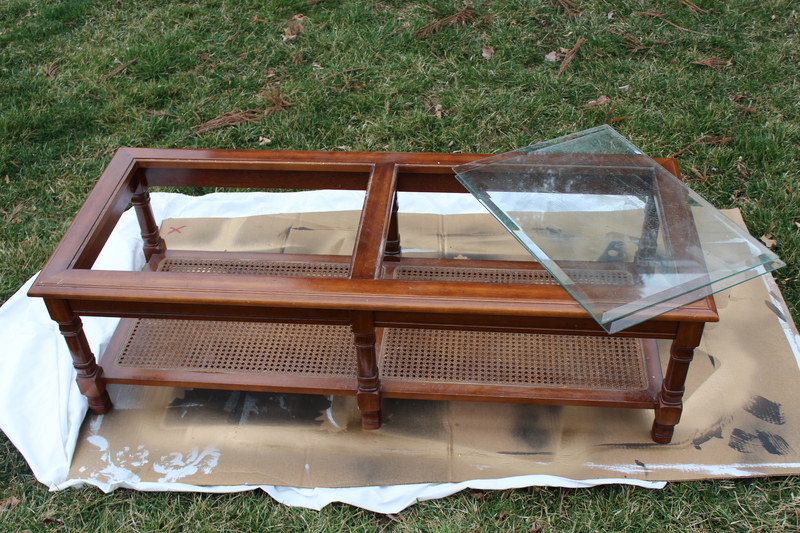 There are two beveled pieces of glass that sit in the top of the coffee table and they were in good shape as well. Overall the coffee table was sturdy and in good condition. So, I tossed it in my car and brought it home. I took advantage of the great weather yesterday and started to work on the coffee table rescue! I used a brush to clean off the rattan on the bottom and then used a damp cloth to clean the rest. Using my favorite Amy Howard Chalk paint I painted the first coat. It’s looking better already!